Problems in one’s life can result from Sha Chi or killing arrows in the form of rooftops, poles, corners of buildings, noisy dogs, unsightly trash receptacles, undesirable neighbours etc directed at one’s home or place of business. They can all be deflected by the simple placement of a bagua mirror on top of your door or outside of your window. It is best not to use this particular mirror indoors and always have it facing outward. 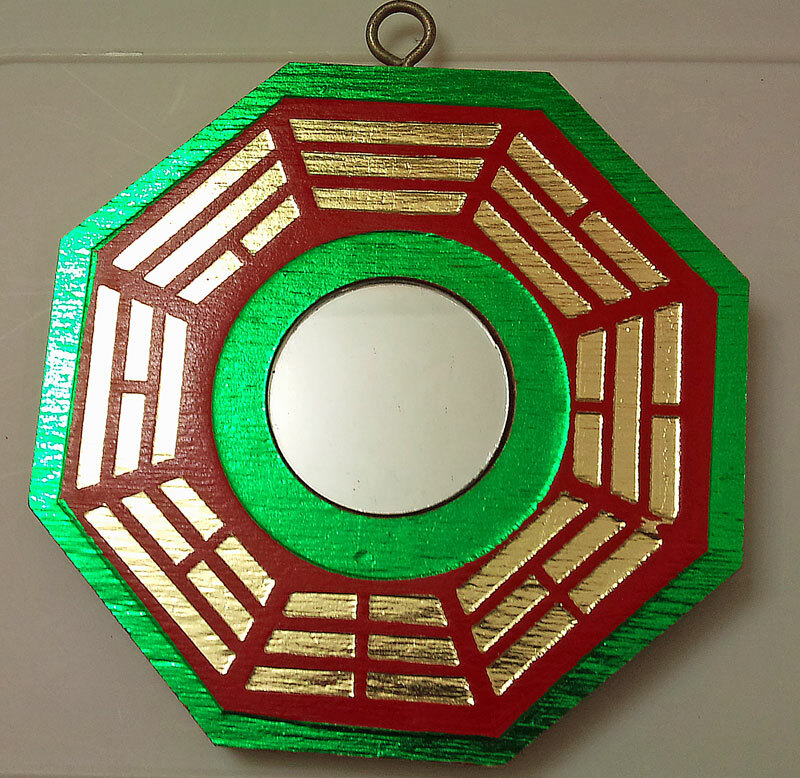 The garish but very effective octagonal bagua mirror has red for protection, green for good health, and gold for prosperity. The bagua mirror is empowered by the symbols of the trigrams that surround its reflective surface. It’s important to place the mirror with the proper trigram facing upward (See photo). If you don’t have a bagua mirror, an ordinary round or octagonal mirror in place of the bagua will suffice. This entry was posted in Feng Shui and tagged advice, decorating, feng shui, good health, home, killing arrows, octagonal mirror, office, photo, reflections, wisdom. Bookmark the permalink.